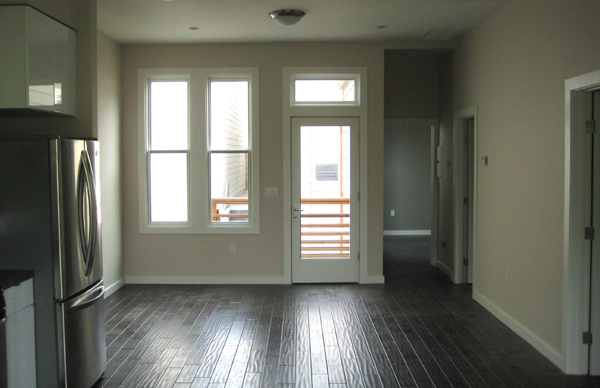 The cottage remodel with two apartment is now completed and ready for move-in. Here’s a view in the upper unit living-dining rm / kitchen room toward the front. 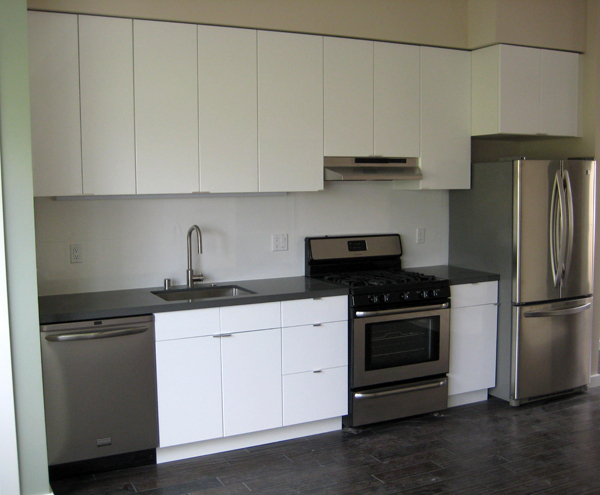 We went with mid-range / affordable (but tasteful) finishes such as Ikea kitchens because these will be rental units. From the courtyard looking at the front of the cottage at the back. The red wall on the left is a 3-unit building at the front of the same lot. 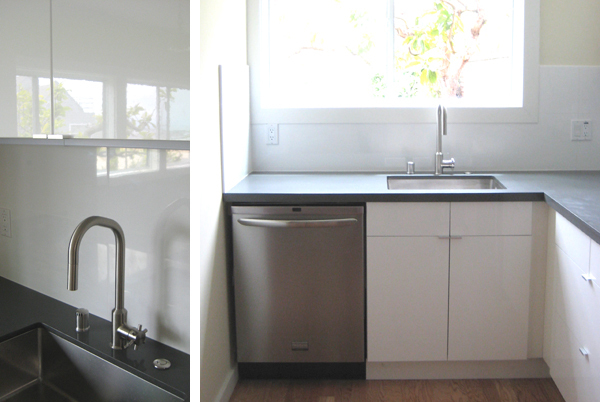 Below are some views of the Ikea kitchens in a white lacquer finish with large white tile backsplash: The cleaning crew hadn’t come yet when I took these photos, hence the dusty floors! 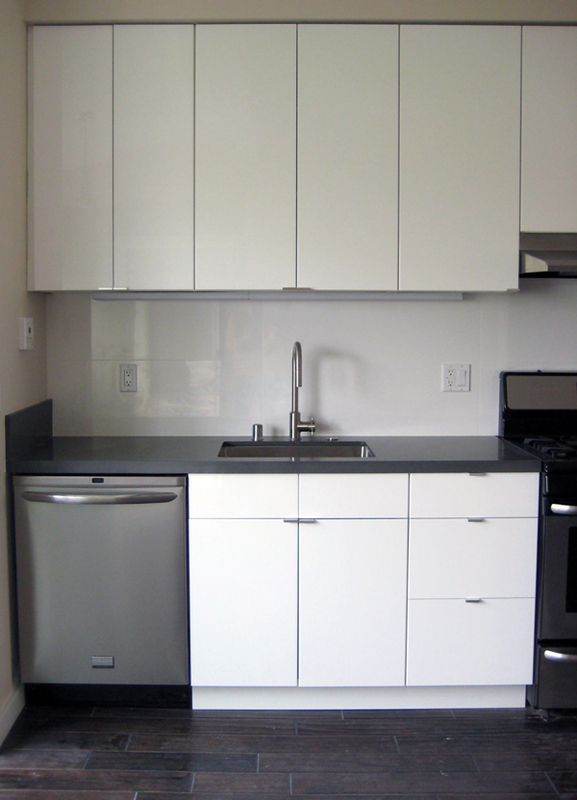 We got lots of storage in the 39″ high upper cabinets, taking advantage of the 9’+ high ceilings. Because this building is essentially in the backyard it has lots of greenery outside the windows looking into the neighboring gardens. The front building was remodeled at the same time; I did the design way back in 2007 at my old firm. Above is a view of the Edwardian street facade. 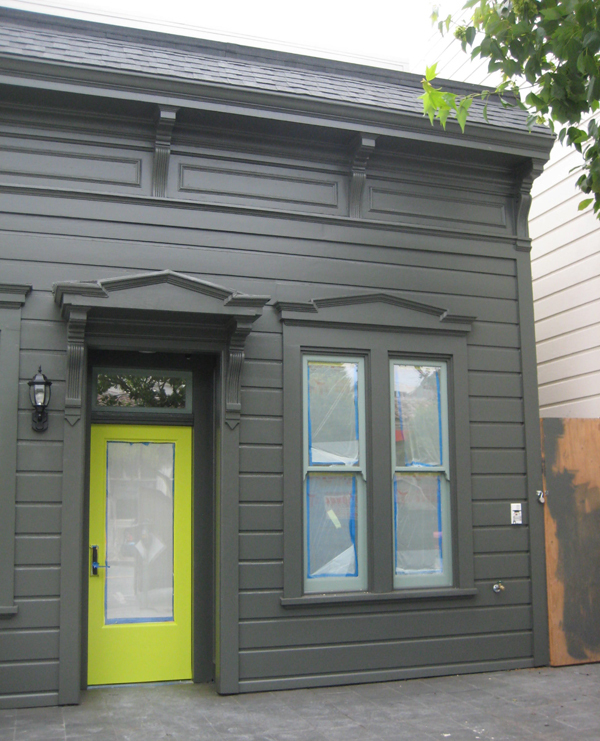 The owner worked with a colorist to choose the palette – I really like that it’s all one color! 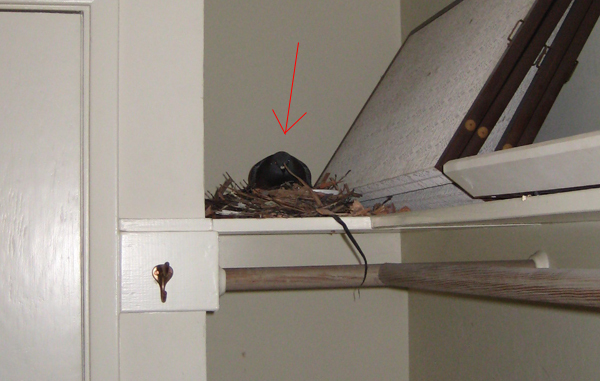 Obviously interior paint was still going on… I’ll go back and take more photos – I think the front door is no longer lime. 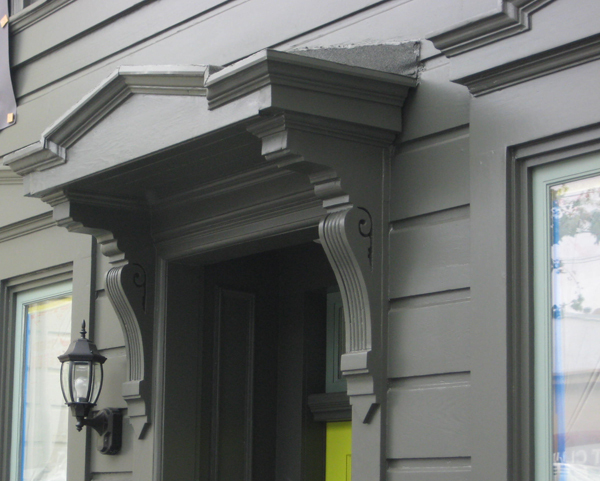 Using a monotone palette celebrates the original detail in a subtle way, rather than using a different color for each of the million pieces of festoonery. 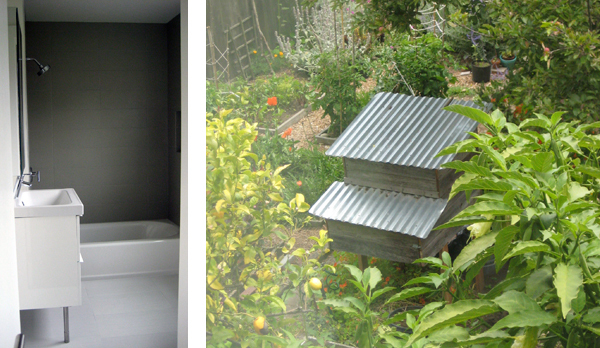 On the left is a photo of the one of the Ikea-finished bathrooms….then looking out the window I took this photo of what I think is a chicken coop in the neighbor’s yard! Cute little corrugated-metal roofed hutch. Maybe rabbits live in it.. 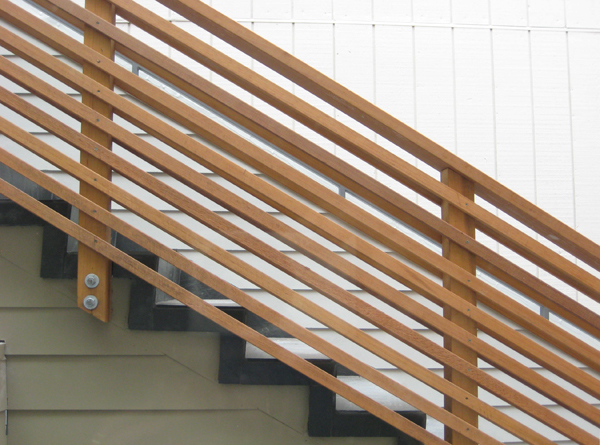 The new relocated stair and railing. Hey, what is that peeking from back there? 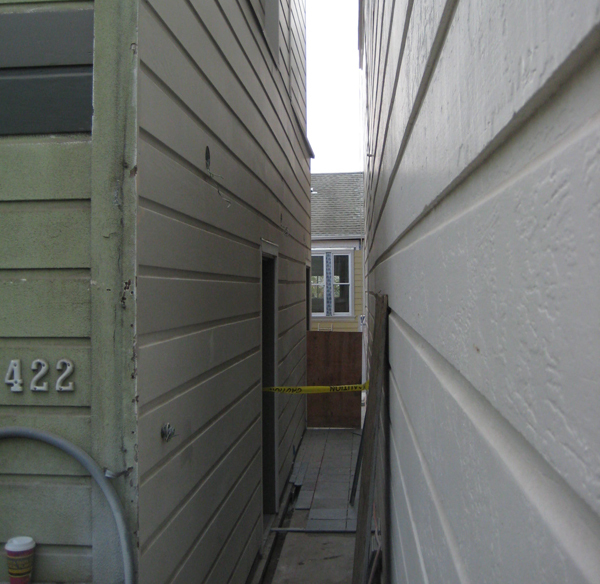 Ever look at that ugly cottage in your back yard and wonder, gosh, what ever kind of siding do I put on it? 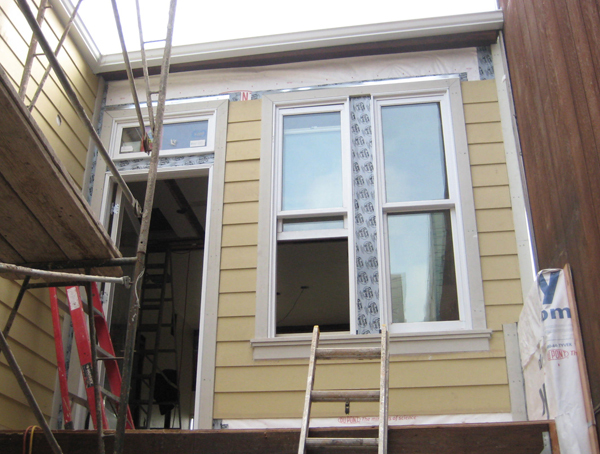 We went with Hardie clapboard siding. A clean and simple yet slightly traditional look for the upgrade of this building. 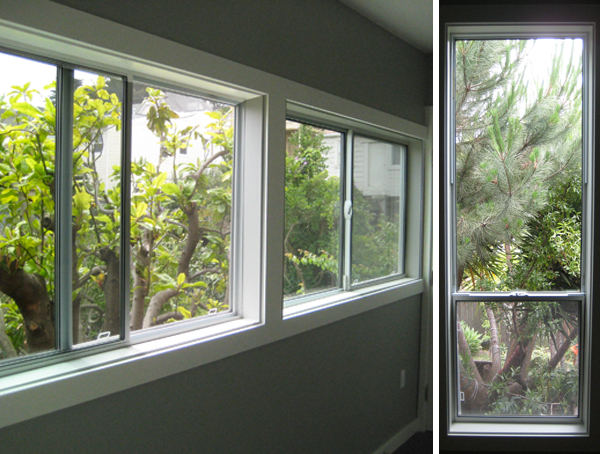 Larger, more vertical windows at the courtyard bring more light into the rooms and accentuate the 10ft tall ceilings. 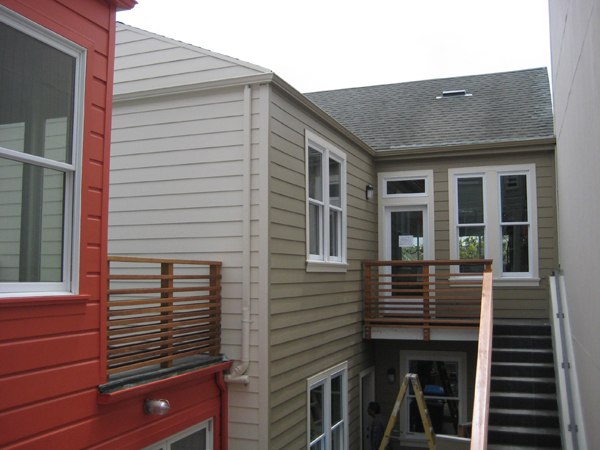 This is the color that the siding comes – not yet painted. Upstairs the living spaces are now open to each other, front to back. Photo below looking at the back wall, the older 70s window shapes had to be maintained because they’re directly on the property line. 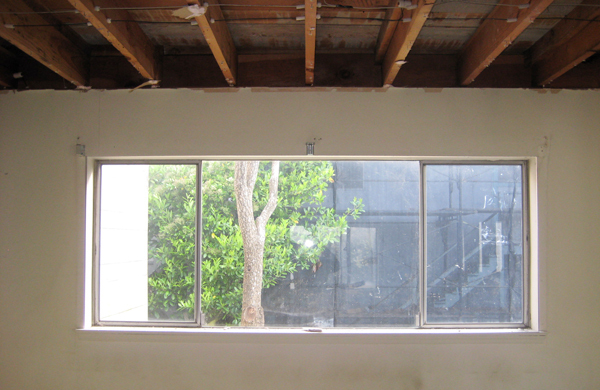 Or we would have increased them – why, why is there so much blank wall space above these windows? To hang fun pictures? Fact of the day: windows closer to the ceiling bring light deeper into the room. Push ’em up! I like the look of the exposed rafters but this is just temporary, to be re-sheetrocked. 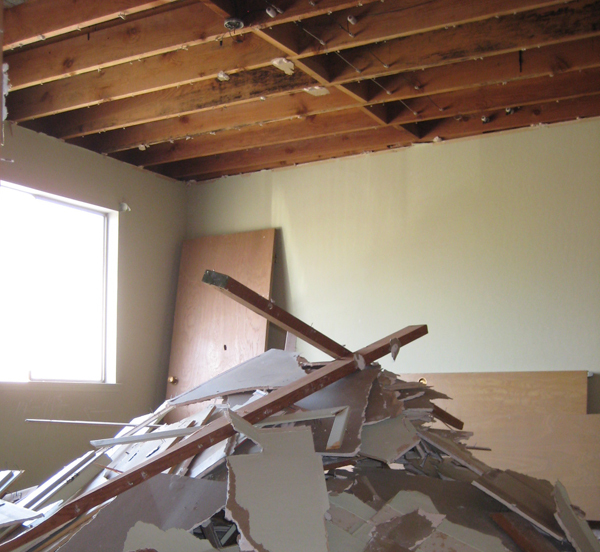 Quite a heap of debris here in the future master bedroom.. The original roof plank sheathing looks like concrete forms – how thrifty of the builders to recycle them! 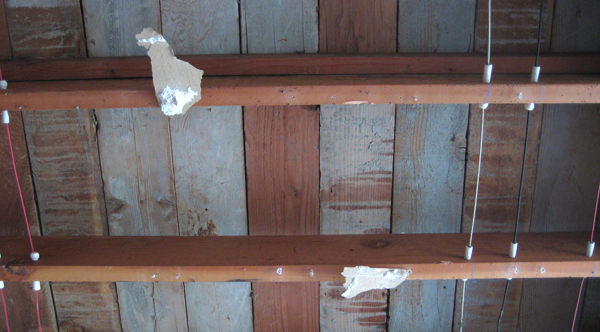 Note the absence of any insulation in this ceiling – typical of many ‘older’ buildings in San Francisco, even from 1959. Above, some slightly mod original details from the apartment building, unit #2. There are some cool shapes here and the materials are pretty cheap, but I thought I’d document the 1950s efforts. 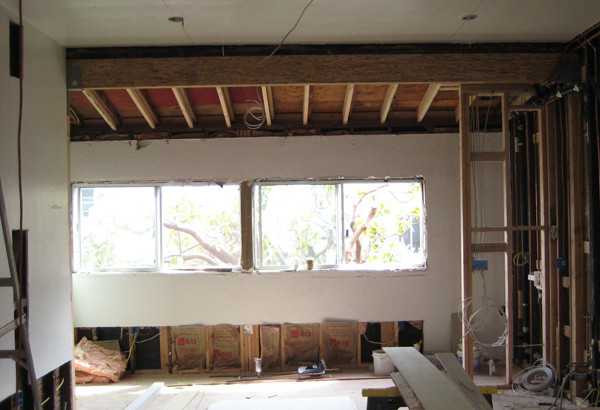 Below, we inserted a PSL into the ceiling to catch the joists, which will give us a flush ceiling surface. 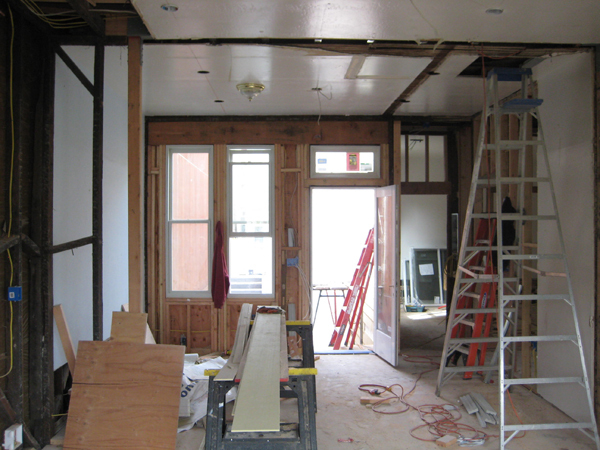 There was originally a dropped soffit between the kitchen and living room, which we’re opening up. Above is the (foggy) view out over San Francisco. 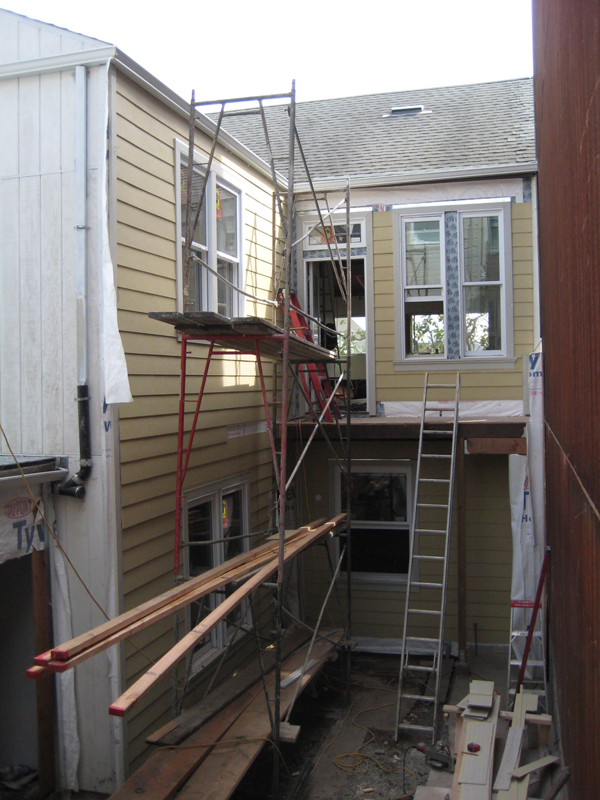 The scaffolding is up to install the new windows and siding. 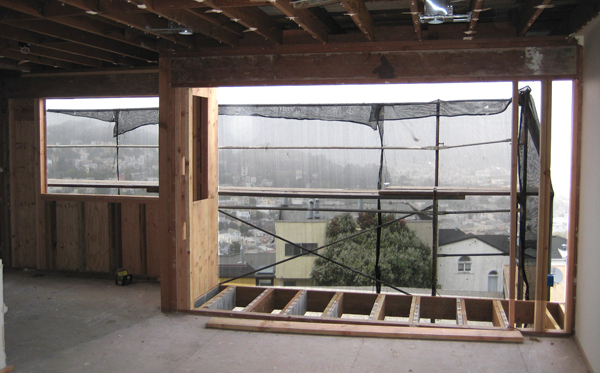 We opened up this view wall to have all sliding doors out to the balcony – previously there was a smallish window at waist-height. The balcony will have glass guard rails to maintain the view.